Satellite thermal land temperature analysis of City of Stirling with red hottest, blue coolest. SATELLITE imaging revealing the hottest suburbs in the City of Stirling is cause for concern, according to scientist Paul Barber. 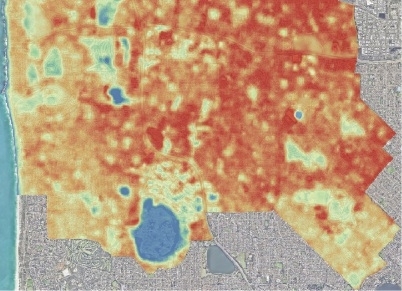 Thermal land surface temperature analysis of the City completed by Dr Barber shows a link between canopy cover and surface temperature of suburbs, which contribute to the urban heat island effect. Dr Barber said leafier suburbs in Perth were up to sixC cooler than newer treeless ones. “We see across Perth newer suburbs with wall-to-wall houses and very little space for trees can be as hot as Perth Airport on a hot summer’s day,” he said. Dr Barber said Westminster had the hottest land surface at 35.2C, only .7C cooler than Perth Airport, followed by Mirrabooka at 35.1C and Nollamara at 35C respectively. “These three suburbs are amongst those residential suburbs with the lowest canopy cover,” he said. Mayor Giovanni Italiano said the City had set a target for an average of 18 per cent tree canopy cover across Stirling by 2030 but clearing of private land could hinder efforts to replant trees. “While the City can maintain and plant trees on land that it has control over, the current gap in planning legislation at the State level makes it very challenging to prevent tree loss on private land,” Cr Italiano said. Cr Italiano said the City was aware of the flow-on effects of high urban temperatures such as health impacts and increased greenhouse gases. Dr Barber said it is not enough to leave some public open space and build houses that took up most of the block size. “If no action is taken and we don’t think carefully about planning, designing and developing cities to allow space for trees and greenery, then heat will increase over time,” he said. Cr Italiano said the City was exploring ways to help preserve trees on private land.